Butternut squash is another fall favorite of mine. It’s great source of vitamin A, vitamin C, potassium and fiber. This versatile vegetable is great in soups, as a side, mashed, roasted, or stuffed. Preheat oven to 425 degrees Fahrenheit and line a baking sheet with foil or parchment paper. Peel butternut squash and remove seeds. 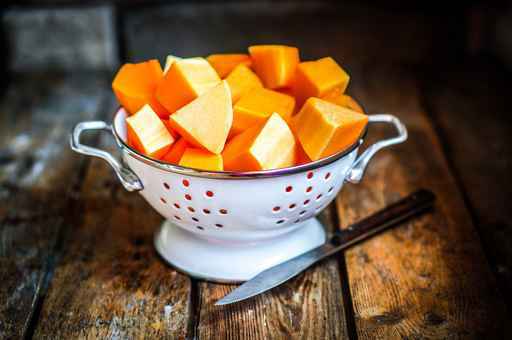 Cut the squash into 1-inch cubes and place in large mixing bowl. Add just enough maple syrup to coat the squash then add cinnamon and salt and pepper and toss to mix. Transfer the squash to the prepared baking sheet and bake for 35-40 mins, tossing about halfway through.